I supported Mike Huckabee throughout the 2008 Republican Presidential Primaries, until his withdrawal. I became very familiar with the charges that Huckabee was not conservative. Some outright called him a liberal. I knew what the genesis of these charges was and why they were mistaken, and I countered them repeatedly in that campaign and have continued since. However, I’m a politically observant Texan and also know that David Dewhurst is not a philosophical conservative, and that Ted Cruz is. Perhaps it’s because of his familiarity as an Arkansan with Dewhurst’s name in Texas politics and/or simply following on the support of Rick Perry; I don’t know. 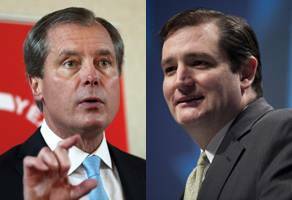 But in endorsing David Dewhurst over Ted Cruz for the Republican nomination for the US Senate from Texas, Huckabee is just wrong. But speaking of Romney, if you’ve read much of what I’ve posted for the past year or so, you know that I’ve been very resistant to Mitt Romney as the Republican presidential nominee. And I’ve often said that I don’t doubt that Romney’s sentiments lean away from unrestrained liberalism. But that defines the Republicanism of the Depression/New Deal until Barry Goldwater in the early 1960s. Clear philosophical conservatism only reached ultimate national success with Ronald Reagan in 1980. In truth there had been no comparable Republican activity since Calvin Coolidge in the 1920s. What I say about Romney is that in the course of long and close observation, I see no fully articulated conservative philosophy that determines his thoughts and decisions. And there’s no reason there should be one. Romney’s father George, the automobile executive, Michigan Governor and briefly a Republican presidential candidate in 1968, was a standard moderate Rockefeller Republican. I do detect in Romney the typical sense of conservative Republicans as extreme and motivated by undignified emotions rather than a consistent philosophy. This shows in his policy proposals and disinclination to “set his hair on fire” and such. And this is similar to how I perceive David Dewhurst. He is a provisional conservative, not enlightened and defined by a clear and thorough objective; and not only a selfish and grasping one. A true conservative understands that a thorough respect of liberty within the bounds of the protection of life, liberty and property, contrary to the impulses of liberalism, naturally produces the most opportunity and prosperity for the entire society. And without such a clear and illuminating respect, our culture is littered with tempting ideas to the contrary. Like Romney, I’m not angry with Dewhurst for not following a non-existent instruction manual. You can find a compendium of counter-conservative actions that these men have taken at most any conservative advocacy organization. But these are only the manifestation of the lack of a conservative perceptual scheme that is evident when a true conservative watches and listens to such people. Rick Perry has endorsed Dewhurst. Remember 1) that there is a considerable loyalty issue to one serving in the same state administration. And 2) though I think Perry increasingly understands the limitations of government and the incursion of the federal government on state sovereignty, he is still a recovering Democrat and not an absolute stickler about the ideal of liberty. Ted Cruz is a genuine conservative and has shown it as an advocate and lawyer, and as Texas’s Solicitor General. He’s the kind of true conservative mind that the US Senate and Texas needs, at last, to replace Kay Bailey Hutchison. Take a look at his website and his record and if you believe in the justice and power of conservative ideas, you will see what I am talking about.